ItemA-03098 - The Church (St. Paul's) Esquimalt, V.I. ItemA-03099 - The Royal Navy Cemetry [Cemetery], Esquimalt, V.I. [Vancouver Island]. ItemA-04286 - Richfield; The Court House; The Magistrate's residence; The Prison; The Judge's residence; The old Bank House of the British Columbia Bank. ItemA-03849 - Wharf Street, Victoria, B.C. ItemA-03910 - The Colonial Hotel, Soda Creek, Fraser River. [R. McLeese ]. ItemA-04046 - Richfield, Williams Creek, Cariboo. ItemB-01452 - The Post Office; The Custom House; Victoria, B.C. ItemC-05527 - Esquimalt, V.I. [Vancouver Island]. Item A-03849 - Wharf Street, Victoria, B.C. Restriction: image HP08735 is a glass plate negative. Researchers should consult the online reference image or reference room copy prior to consulting the original. MS-3100, Album 1, Page 14. 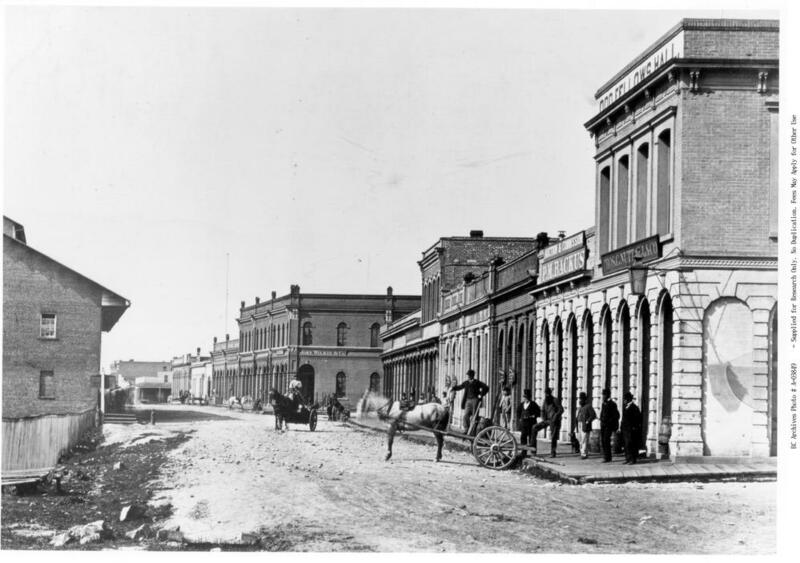 Looking North on Wharf Street from Fort Street, Victoria, showing the Oddfellows Hall, and John Wilkie and Co., P.M. Backus, and Thomas C. Nuttall and Co. stores.